The Feather Duster, also known as Giant Feather Duster, has a fan-shaped crown (radiole) that is tan or orange with brown band colorations. The radiole of some species from certain locales may be up to 7 inches in diameter, or of brighter colors. The Feather Duster uses the radiole to filter out small floating organisms, which it directs toward its mouth, located at the center of the crown. It protects its segmented body by secreting a parchment-like tube to cover itself. When it is disturbed, it can quickly pull in its radiole into the tube. If it is severely stressed, it will discard its crown, growing it back later. 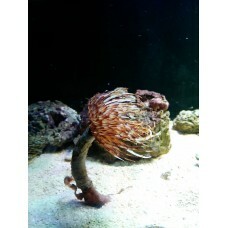 The Feather Duster is usually found in the coral rubble at the base of the reef aquarium, with some of the rubble being incorporated into its parchment-like tube. It needs to be housed in a well-established reef system as it is dependent upon plankton for its diet. It is very intolerant of copper-based medications.